It has been the best. The. Very. Best. In fact, we both feel the state of Matrimony deserves the Seal of Prepaliciousness. We are extremely grateful, as we have been more than blessed. Lest we turn weepy and sentimental, we close with a wish your weekend is just a scintilla as happy as these sixteen years have been, for that would make you very happy indeed. Oh my. What a beautiful pair you are. Congratulations on 16 years of happiness and my best wishes for many more. HAPPY ANNIVERSARY to the most lovely, prepalicious couple ever! Wishing you both a fabulous anniversary weekend and all the best for a lifetime of happiness together. This post made my day! Lots of love to you! CONGRATS!!! I believe in marriage and all it takes to have it be so blessed! Congratulations!!! Finding love is a spectacular thing! You looked so beautiful. Cobgratulations to you and the Consort on 16 wonderful years! You two could not be cuter. Happy anniversary to you both!!! I wish you both many more years of the very best. A very Happy Anniversary to you, and many more. Congratulations! happy happy day! 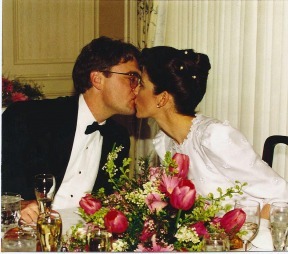 16 years ago I was eating waaaay too much red velvet cake- little did I know that I was also celebrating your wedding! Congratulations! 16 years is quite an accomplishment, you should be proud. How wonderful too that you both are still so happy, if not happier now than you were then. Here’s to many many more!! congratulations to you and the Consort. i love your dress and hairstyle. have a wonderful weekend celebrating with each other. take care. Congrats and Happy Anniversary to the Prepalicious Princess & Consort!! TP, you are SO ELEGANT!! And timeless!! Jackie Kennedy is in awe of you and your wedding day beauty!!! What a great picture of a great couple. Cheers to your 16 years of wedded bliss!! Happy Anniversary! Whatever happened to sleeves on wedding dresses? A very Happy Anniversary to both of you! Love that picture of you two. Happy Anniversary and many, many, more!! HAPPY ANNIVERSARY!! Hope you have a wonderful weekend celebrating. Love & blessings from NC! WHat a special day! Congrats to you! A very happy anniversary to the two of you! Aww, congratulations!! 🙂 You two are so cute! Happy anniversary and many more! Your dress is lovely – and I am a big believer in sleeves! Gorgeous dress (with sleeves!!! Love it!) and a gorgeous couple to match. It’s wonderful knowing that after 16 years, you are still in “mass love”. Everyone should be so lucky. Hope you are having a wonderful weekend! Happy Anniversay! Here’s to many more years together. happy happy anniversary! And best wishes for MANY more! Congratulations TP and the Consort!!! What a beautiful picture! I hope y’all have had a wonderful, relaxing and fabulous day. Hugs! Happy happy anniversary to you!! You are one beautiful princess. I hope you both had a wonderful weekend celebrating together! Congratulations! I love your picture. Yall are absolutely adorable!!!! Happy belated anniversary! !